The GI Bill is a fantastic military benefit that helps all military personnel attend college and go on to have exciting, successful careers. Depending on how long you enlist with the Army and the job you choose, you can get up to $81,756 to help pay for college. All you have to do is give $100 a month during the first year of service. The program offers 36 months of benefits up to 10 years after separating. The new Post-9/11 GI Bill offers 36 months of benefits up to 15 years after separating. Under the Post-9/11 bill, veterans and servicemen and women can receive a host of educational benefits, including paid tuition and fees, $1,000 yearly stipend for books and other supplies and a monthly stipend for housing. $2,000 is also available for one certification or licensing test, and $1,200 is available for a year's worth of tutoring assistance. For Active Duty service members, the following plans are available. The Post-9/11 GI Bill NOW ACCEPTING APPLICATIONS! The Post-9/11 GI Bill is for individuals with at least 90 days of aggregate service on or after September 11, 2001, or individuals discharged with a service-connected disability after 30 days of service. You must have received an honorable discharge to be eligible for the Post-9/11 GI Bill. The Post-9/11 GI Bill will become effective for training on or after August 1, 2009. This National Call to Service Incentive program requires a participant to perform a period of national service to be eligible for benefits. It is a Department of Defense program that is administered by VA.
For Veteran service members, the following plans are available. For Survivors' and Dependents' of service members, the following plans are available. 1. It gives servicemen and women the opportunity of resuming their education or technical training after discharge, or of taking a refresher or re-trainer course, not only without tuition charge up to $500 per school year, but with the right to receive a monthly living allowance while pursuing their studies. 2. It makes provision for the guarantee by the Federal Government of not to exceed 50 percent of certain loans made to veterans for the purchase or construction of homes, farms, and business properties. 3. It provides for reasonable unemployment allowances payable each week up to a maximum period of one year, to those veterans who are unable to find a job. 4. It establishes improved machinery for effective job counseling for veterans and for finding jobs for returning soldiers and sailors. 5. It authorizes the construction of all necessary additional hospital facilities. 6. It strengthens the authority of the Veterans Administration to enable it to discharge its existing and added responsibilities with promptness and efficiency. With the signing of this bill a well-rounded program of special veterans' benefits is nearly completed. It gives emphatic notice to the men and women in our armed forces that the American people do not intend to let them down. 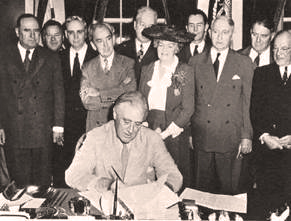 By prior legislation, the Federal Government has already provided for the armed forces of this war: adequate dependency allowances; mustering-out pay; generous hospitalization, medical care, and vocational rehabilitation and training; liberal pensions in case of death or disability in military service; substantial war risk life insurance, and guaranty of premiums on commercial policies during service; protection of civil rights and suspension of enforcement of certain civil liabilities during service; emergency maternal care for wives of enlisted men; and reemployment rights for returning veterans. This bill therefore and the former legislation provide the special benefits which are due to the members of our armed forces -- for they "have been compelled to make greater economic sacrifice and every other kind of sacrifice than the rest of us, and are entitled to definite action to help take care of their special problems." While further study and experience may suggest some changes and improvements, the Congress is to be congratulated on the prompt action it has taken.